Topic: My spark plugs ! The engine has been using oil for years now (no leaks). I'm ASSUMING the condition of the plugs are a result of burning oil? Does the fact that all four plugs have the same buildup tell me anything about why I'm using oil ? My compression tester gave up after the second cylinder but I believe my compression is acceptable. Re: My spark plugs ! Burning oil. Most common 2 locations, past rings and past valve seals. Most likely is rings if all 4 doing same thing. I was really hoping to find out that the plugs where a sure sign my valve seals where bad and some new ones would fix it right up. I didn't figure I'd get that lucky. How did you determine that it is your valve seals ? The answer can be found with a bore scope. Ring wash will be seen around the edge of the pistons if it's the rings failing. Large amounts of oil dripping from the valves when open will be your indication of valve seals. A quality bore scope can tell you a ton. What were the compression #'s for cyl. 1 and 2? Thanks, that's good to know. I may look into this. #1 was around 150 at 5 cranks but seemed to build up more if I kept going. Years ago I blew a head gasket and the #1 cyl took some water and lost a bit of compression after that. #2 was at about 165 at 5 cranks but went up to around 180 with 7-8 cranks. The test was kind of questionable I usually go through the cylinders twice. If I have the cylinders scoped and find that the rings are bad. Am I looking at a full rebuild or is it possible to just replace the rings? I've been driving the truck 8 or 9 years and the motor doesn't knock or rattle just the oil consumption. I'm really not excited about dropping a bunch of $$$$ on this truck right now, especially on a 22r. Pretty much what I have done for years. If I have the cylinders scoped and find that the rings are bad. Am I looking at a full rebuild or is it possible to just replace the rings? I've been driving the truck 8 or 9 years and the motor doesn't knock or rattle just the oil consumption. By the time you tear it down to the point wear you can get to the rings, you might as well and rebuild it, which at that point, barring a major FUBAR in parts and/or machine work, it should be good for a few 100k. 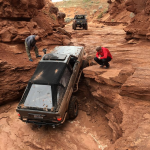 I would start with the cylinder inspection, or do a compression test and see what the numbers are, if not good, see where the loss is and go from there. If it is just the valve guides, it shouldn't cost you to more than a couple $100 to pull the head and have it rebuilt, if you pull it yourself. I'm really not excited about dropping a bunch of $$$$ on this truck right now, especially on a 22r. Whether or not rebuilding is worth the cost depends on what you can do yourself. First… I would NEVER let my spark plugs get like that! Looks like neglect!... shameful. How many miles on that engine? How many miles on that engine with those spark plugs? How much oil is it using? Does it smoke?.. at cold start, warm start, or under load? Any crankcase blow-by or rocker cover pressure? If you want to get more information about its condition, do a complete compression test and a leak down test. The head on these engines is THE most important part and can affect engine life and performance more than any other component!! If the head needs rebuilding I doubt you will do it successfully on the cheap… it needs to be inspected, mic’d, and done correctly by a professional or expert head builder. Re-ringing a tired engine most likely will not be worth the effort, time, or expense. That's the plan. Hopefully I can get another year out of it. 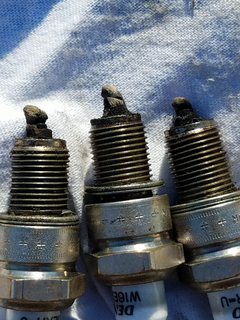 I just wanted to verify that the oil consumption was what did that to my plugs. Also, I've seen more experienced people do things like put new bearings in an engine that starts knocking and have good results. I was just curious if I could correct the problem and prolong the life of the engine. After rebuilding the 22RE in my 80, I'm not to excited about rebuilding another 22r/re. Its hard to justify a 22r/re being worth what it cost to do it right. When this engine is done I may consider an engine swap of just updating to a 3rd gen 4runner. 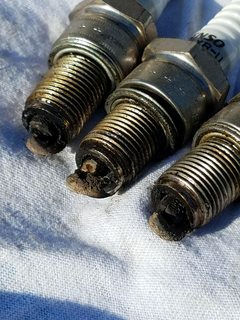 I dont think the plugs have been in there more than 10k miles, I could be wrong. It's my only daily driver, I try and change the plugs once a year. Unknown miles on truck and engine. I dont keep track of oil. I top it off, roughly half quart or so every 300-400 miles. Smoke? Yeah, on cold start for sure. Warm start, yeah. I don't notice smoke while driving but i'm not looking for it either. I think there is some blow by. I get some seepage around the pcv and the vent hose on the valve cover. At some point I need to get a leak down tester and learn to use it. That's a tool/skill that would have helped me out many times. it's all a learning experience for me. 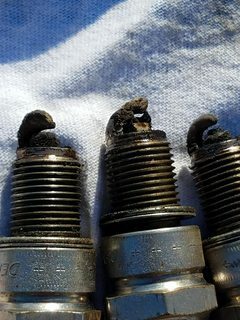 So 10K or 1 year on spark plugs is not neglect... glad to read that. Those plugs are really fouled... I've not seen plugs that bad out of a 22. 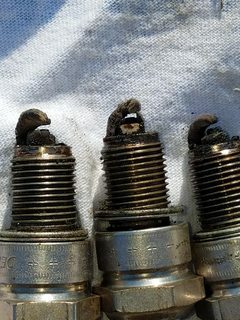 If you just replace the spark plugs you might consider going up one heat range. I think a compression test and a leak down test can tell you quite a bit about what's going on in the engine. Of course with a leak down tester you need an air compressor. Page created in 0.246 seconds with 28 queries.